Several new GSW Resources have been posted from the VA DoD Survivors Forum. These pertain to CHAMPVA eligibility and benefits, Forever GI Bill, Special Operations Warrior Foundation, NCA Legacy Campaign, and Helping Bereaved Men. These can be found at the top of the large table at GSW resources, or you can click this link. The tour following this year's Gold Star Wives National Convention has been announced and registration is available. Click here for the Post Convention Tour information and registration. Click here for National Convention information and registration. The after convention trip will be a 2 hour cruise on the Mississippi River with Brunch and Dessert served during the cruise. There will be an open bar for those who wish. The cruise is on the Magnolia Blossom on the scenic Mississippi River. There will be a variety of things to see and the boat can accommodate groups up to 100 people. The brunch will include eggs, sausage, ham, baked chicken, apple rolled pancakes, potatoes, fresh fruit, pasta salad, muffins, and Danish rolls. There also will be an assortment of desserts. After the 2 hour cruise the bus will pick us up and go to the U/M Landscape Arboretum which is rated the best botanical garden in the USA. There are 120 acres of trees, flowers, prairie and plants. They are arranged in different gardens and there are numerous trails for those who are adventurous. For those that do not get around very well there are many gardens close to the main building. The main building usually has some type of exhibit going on and there are elevators to the second floor which has a small café for those in need of refreshments. The total cost of the trip is $95.00 and includes the bus, 2 hr cruise, brunch, and the landscape arboretum. The trip starts at 11 am when the bus will pick us up at the Crowne Plaza Aire and we anticipate returning around 5 pm to the hotel. Mail this form with payment to: CAROL DEVORE, 56 – 33RD AVE S, #313; ST CLOUD, MN 56301-3722 Postmarked by June 30, 2018. Registration is not complete until payment is received. We cannot accept registrations after June 30, 2018 because the bus company must have a full itinerary by July 2. Please call Convention Chair, Crystal Wenum at 715-386-8615 with any questions or email her at: crystalw @pressenter.com. The Union County 4th of July Veterans Parade committee (Pennsylvania) is looking for Gold Star family members, including spouses, to honor and recognize during their upcoming 4th of July parade. For more information see the link below. For those who have recently lost a military loved one or haven’t been a surviving spouse long enough to know all the ins and outs of rules and red tape, here’s an opportunity to get questions answered and learn what to do at specific milestones — Joint Base Lewis-McChord’s Survivor Outreach Services is offering a milestone benefits conference call Jan. 24 from 1 to 4 p.m. The free dial-in number is 605-475-4120, access code 8475028. This is the first time the event has been offered, and it’s expected to save valuable time for clients who have a variety of questions for different agencies and don’t want to spend all their time calling one organization after another. “If you’ve been through trying to call Social Security or other agencies for hours, you can appreciate an opportunity to talk to everyone you need to in one call,” said Tina Mann, SOS financial counselor. A few of the milestones Mann refers to involve medical care. The surviving spouse receives TRICARE for three years before their care switches to retiree status, Mann said. “The child gets TRICARE until they age out,” she said. The event will be on a timed schedule, so it’s important to call in at the time a representative will be available for your specific need. 1 to 1:30 p.m. Veterans Affairs representative — dependency and indemnity; the Marine Gunnery Sgt. John David Fry Scholarship — which provides GI Bill benefits to the children and surviving spouses of service members who died in the line of duty while on active duty after September 10, 2001. Eligible beneficiaries attending school may receive up to 36 months of benefits at the 100 percent level; and remarrying. 1:30 to 2 p.m. Social Security Administration representative — benefits for children when they turn 18 and are still in school; also widows benefits start at age 60. 2 to 2:20 p.m. TRICARE — New changes for TRICARE and if benefits end if surviving spouse remarries. 2:20 to 2:50 p.m. Retirement Services Officer — Survivor benefits for spouse and child. Benefits change when child turns 18; benefits for spouses who remarry. 2:50 to 3:15 p.m. Exceptional Family Member Program — benefits continue for child and spouse when sponsor dies. 3:15 to 3:45 p.m. Employment Readiness Program — Benefits for surviving spouse interested in getting into the Federal Government and services offered. 3:45 to 4 p.m. General questions and answers. IN WITNESS WHEREOF, I have hereunto set my hand this first day of November, in the year of our Lord two thousand seventeen, and of the Independence of the United States of America the two hundred and forty-second. 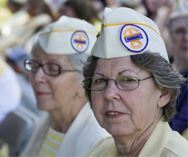 It is the time of year to renew your Gold Star Wives of America, Inc. membership. Gold Star Wives needs you, your support, your ideas and your strength to continue to work on improving our benefits. · Effective January 2015, the Fry Scholarship which previously had been only for surviving children, has been extended to surviving spouses of those who died in the line of duty on or after September 11, 2001. · The creation of an Office for Survivors within the Department of Veterans Affairs (Moira Flanders, Director, 1-202-461-1077) to assure a continuity of equitable benefits and an improved delivery of benefit information to survivors. · Reinstatement to receive DIC if you have remarried and that remarriage has ended in death or divorce. · Retention of DIC upon remarriage after age 57. If you remarry, report your new name and address to the VA.
· TriCare for Life (TFL) with a prescription benefit for those over 65 and eligible for TriCare. · ChampVA for Life (CFL) with a prescription benefit for those over 65 and eligible for ChampVA. · ChampVA benefits for spouses who remarry after age 55. · Equal cost of Living adjustment (COLA) for DIC widows. We continue to be available for your questions and concerns when you have “no place to turn.” It is only with your continued fellowship, dues and donations that the above increased benefits have been accomplished. Without you there would be no Gold Star Wives organization to continue to reach out to new surviving spouses and to maintain our benefits as well as to seek new and improved ones. A video of Michael Reagan, speaker at the GSW 2017 National Convention, can be found online.